Fairfield, CT - Hotel Hi-Ho has announced the integration of tech-savvy upgrades at its Fairfield-based property. First, Hotel Hi-Ho now offers guests a completely virtual customer service experience, meaning no need to stand in line at the front desk upon check-in and check-out. The process is simple and doesn't require downloading an app. Prior to arrival, guests will receive an email and/or text message with their room assignment and the access code they'll use to enter their room. In lieu of a front desk attendant, guests can now reach a Hotel Hi-Ho employee 24/7 via phone. Any assistance, be it a question about the room or a request for a dinner recommendation, is just a phone call away. Second, all televisions in Hotel Hi-Ho's 40 guest rooms are now equipped with Roku streaming devices, which enable guests to view plenty of streaming channels on a complimentary basis plus the ability to log into their personal streaming accounts, such as Netflix and Hulu. 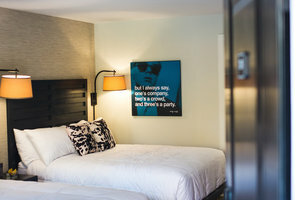 In the coming month, all televisions in the 80 guest rooms at The Circle Hotel Fairfield, Hotel Hi-Ho's sister property, will be equipped with Roku streaming devices, too.